A room in the city i San Sebastian, Spania: Bestill nå! No stag or hen parties accepted automatically. 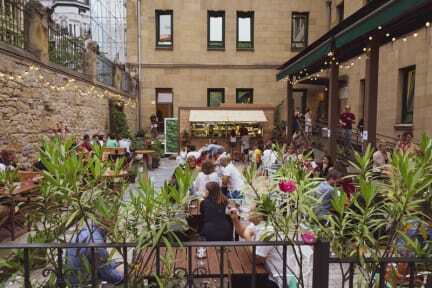 Convent Garden offer their own Restaurant, Bar "La Cripta" and Terrace "el Pation" for the amusment of every guest. A Room in the City is located in the city center of San Sebastian, providing a cozy environment to sleep and meet other travellers and locals, offering the perfect spot to explore the city, the beach and its sorroundings. The hostel is located right in the heart of San Sebastian, just within a 3 minute walk to La Concha beach, a short walk to La Zurriola surf beach and a 10 minute seaside walk to the Old Town, the main hub for nightlife and great food. A Room in the City is situated in the historical centre of the city, the main shopping area and also a pleasant neighbourhood to walk along big avenues and pedestrian streets with plenty of terraces to chill out on and beautiful art nouveau buildings. A Room in the City has 2 different entrances and check in adresses (although the same building! ), please check in your room description to find out where you have to go for check in: calle Manterola 15 or calle Easo 20. A Room in the City offers shared dorms and private rooms in a beautifully decorated building. The rooms are spacious, they have natural light and the matresses have been carefully selected for guest's confort. Common facilities include a living room, library/TV/Computer room and a dining room equipped with microwave, toasters, kettles, fridge, dishes, cutlery, cups and glasses. Please note no stove nor oven are provided. No stag/hen parties accepted at the hostel.